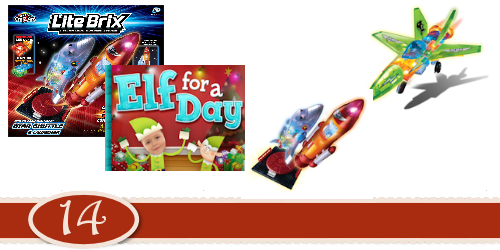 Last Day to Enter Celebrating a Season for Giving Grateful Giveaways! 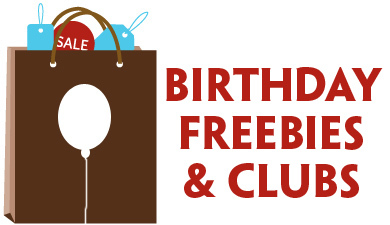 Just wanted to remind you all that you have until 11:59 p.m EST tonight to enter all of the Celebrating a Season for Giving Grateful Giveaways. I have 15 awesome prizes available! Plus, you have additional opportunities to win each prize, since the following 11 blogs are also giving out the same prizes! OtterBox is the #1 selling case for smartphones, and with good reason! Based out of Colorado, OtterBox makes a wide range of sturdy cases dedicated to protecting today’s technological devices. Whether you’re an outdoor adventure seeker, a mom with her hands full constantly, or maybe just a bit of a klutz, they have a case for your phone, MP3 player, tablet or ereader to protect it from life’s everyday knocks and unexpected drops. I’ll admit that I’m hard on my phone — as are my kids who are always asking to play this or that on it. So the first thing I do when I get a new phone is order a new Otterbox case for it. I’ve trusted my phone, iPad, and kids’ iPods to Otterbox for as long as I can remember, and they’ve all been well protected by these quality cases! Follow OtterBox on Facebook and Twitter for mobile news, product announcements and special offers! 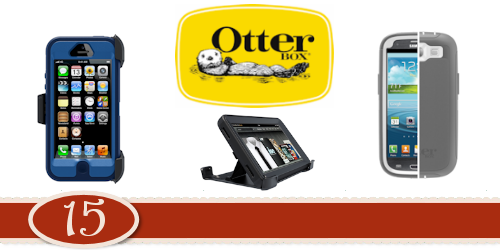 One lucky Deal Seeking Mom reader will win a $100 OtterBox gift code! Entry is simple – just fill out the form below. As a reminder, comments left on Facebook, Twitter or other posts will not be counted. This giveaway will remain open until 11:59 p.m. EST, Monday, 12/10. Any entries submitted after this cut-off will not be counted. Information collected will be used solely for selecting winners and mailing prizes and will not be shared or sold for any other purpose. Winners will be selected randomly and will be notified via email within 48 hours after the close of the contest. This giveaway is part of the Grateful Giveaways: Holiday Event being hosted by myself and 11 other bloggers. You can increase your chances of winning this prize (as well as all of the others on this site), by visiting each of them and entering the same way as you did here. You have plenty of time to get to all of them, since the contest will be open for five full days. If you haven’t already done so, you might want to print out this spreadsheet to help guide you through all of the entries on all of the blogs. As one final reminder, you will want to check out the terms of the giveaway by visiting the Grateful Giveaways: Holiday Facebook page. Just click on the Terms tab at the top of the page. (Note that by entering this contest, you agree that you have read the terms and are eligible to enter this contest). Disclosure: I received the same gift package that the winner will be receiving to facilitate my review. I did not receive any compensation to write this post, but there may be affiliate links that benefit me financially. Either way, the opinions are all mine! Shine a light on your child’s creativity with the LITE BRIX™ Super Light Building System from Cra-Z-Art®, the innovative light-up building construction sets with vibrant sparkling lights in each translucent brick. The possibilities are endless with Lite Brix™, which are compatible with other major brick building systems and allow children to transform their creations into spectacularly-lit masterpieces for daytime or nighttime play. From Super Jet Fighters and space shuttles, to racecars, fire stations, an airport and more, kids can design and create a magical world with Lite Brix™! You’ll find the full Lite Brix™ line at Toys ‘R’ Us, Barnes and Noble and select other retailers. Follow LiteBrix on Facebook for more conversation! The brains behind the JibJab personalized greeting cards – like the fun Elf Yourself app — are now letting your kids star in their own animated bedtime story books. With the free Storybots iPad app, parents can create personalized, animated eBooks that include their child’s name and face in the stories. Choose from a selection of kids’ books, use the app to superimpose your child’s face in the story and enjoy the story! Download the app free and choose from the almost 20 books available. The first book, “Dancing Feet” comes free with the app, and a monthly subscription is just $3.99, with additional books available for just $1.99 each. Follow JibJab on Facebook and Twitter for videos, new stories and more! One lucky Deal Seeking Mom reader will win a set of Lite Brix Building Blocks and a $10 iTunes gift card to add to their Storybots collection! 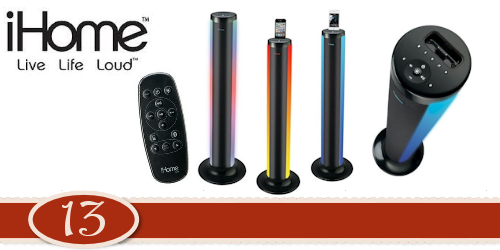 Introducing the iHome Audio iP76 color changing speaker tower with Bluetooth technology! This is a 3-foot speaker tower for iPhone/iPod that charges and plays music! The iP76 has an adjustable LED light cabinet that features color fade, favorite color, pulse to music and strobe effect – a really neat showpiece as well as a dock. The iHome tower also come with Bluetooth technology that is perfect for those who have the new iPhone5 and with auto pairing setting it up is simple and fast. A/V jacks can connect to the tower to your TV as well. This is an awesome unit for parties or just setting the mood at home! Follow iHome on Facebook and Twitter for special offers and product announcements. One lucky Deal Seeking Mom reader will win iHome iP76 Color-Changing Speaker Tower! When it comes to holiday giving, at the heart of what most of us desire to do is to provide gifts that will enhance the life of the receiver. How better to enhance the life of those on your holiday list than to give them a gift that will save them both TIME and MONEY all year long? Freezer cooking isn’t just about meal planning, it is about saving your money and your health by not hitting the drive-thru at the dreaded dinner hour. It’s about learning to be efficient in the kitchen so you can spend more time making memories with your family and friends. This package will help you or a loved one succeed in these areas. Give the gift of getting back to the family dinner table this season! A membership to Once a Month Mom is more than just another meal plan service. It’s about simplifying meal time to spend more quality time with your family. Less time in the drive thru will result in better health for the entire family as well as happier pocketbooks. Have a month worth of meals (or two weeks if you aren’t up for a month) in one day! We do the organizing and planning for you. The membership comes with access to all the menus including customizable recipe cards, grocery lists, instructions, and labels. With six different menus options, there is a menu that will fit every family, including the highly anticipated Paleo menu that will be launching January 1st! Traditional Menu – Designed for ease and efficiency in the kitchen, providing family-friendly freezable recipes. Whole Foods Menu – Freezer-friendly, from-scratch, unprocessed, seasonal meals for you and your whole family. Diet Menu – Lighter, healthier recipes for yourself or your whole family. 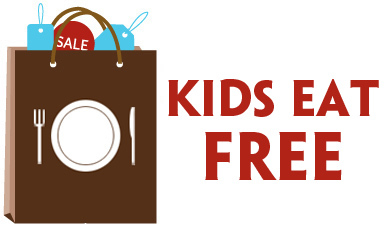 Gluten Free & Dairy Free Menu – Make meals for the special dietary needs of your family manageable, one month at a time. Vegetarian Menu – Family-friendly approach to stocking your freezer with meatless meals everyone will enjoy. Baby Food (Toddler/Kids) Menu – Establish lasting, healthy choices in kids from first foods to adult foods through recipes and monthly menus. Mini Menus – Designed to be a shorter, simpler way for you to put away family-friendly freezable recipes and warm up to once a month cooking. In today’s fast-paced society, TV dinners and fast food can easily take the place of good home cooking. But with the help of one of the most underused appliances in most people’s kitchen — the freezer — anyone can make and preserve about two weeks’ worth of delicious home-cooked meals in a matter of hours. Jessica Fisher’s Not Your Mother’s Make-Ahead and Freeze Cookbook provides the key to doing so. Fisher outlines 200 recipes for delectable breakfasts, lunches, and dinners through the method of batch cooking that saves both time and money. This cookbook puts a modern spin on the age-old idea of freezing meals for later, and appeals to today’s diverse tastes, providing recipes for not only chicken, beef, and pork, but also fish, shellfish, and vegetarian main courses. Fisher also details how to go about using the freezer to its full potential, giving information on the best freezer bags and, most importantly, how to thaw food safely after it has been frozen. This ebook tells one mom’s story of hitting maximum density and how she set to put order into her chaos. Organizing Life as MOM is full of inspiration and planning pages to help you get your act together. It’s a manual for organizing your life as well as putting together a household notebook that suits you and your life. 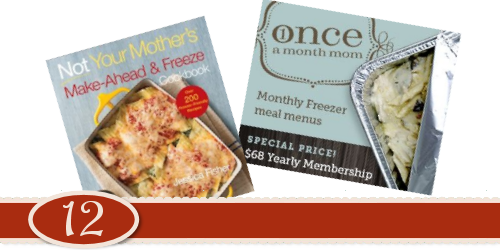 One lucky Deal Seeking Mom reader will win a freezer cooking prize package, including a 1-year membership to OnceaMonthMom.com, a copy of Not Your Mother’s Make Ahead and Freeze Cookbook and a PDF copy of Organizing Life as Mom and all of the printable pages!